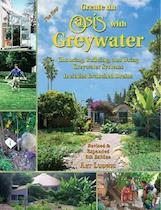 Create an Oasis with Greywater by Art Ludwig, provides detailed information on low-tech greywater systems. We recommend this book for all do-it-yourself installers, as well as for professionals. It also provides complete instructions for more complex installations, how to deal with freezing, flooding, drought, failing septic systems, low perk soil, non-industrialized world conditions, coordinating a team of professionals to get optimum results on high-end projects, and “radical plumbing” that uses 90% less resources.